MARTINSVILLE, Va. – On Sunday at historic Martinsville Speedway, the driver known as “The Outlaw” committed highway robbery. Bullying his way past six-time NASCAR Sprint Cup Series champion Jimmie Johnson with 10 laps left in Sunday’s STP 500 at the .526-mile short track, Busch held on to edge Johnson by 0.263 seconds, denying Johnson a ninth Martinsville victory. A Martinsville winner in 2002, Busch added a second victory at Sprint Cup’s oldest current venue to his resume. Busch’s 25th career victory was his first triumph in the No. 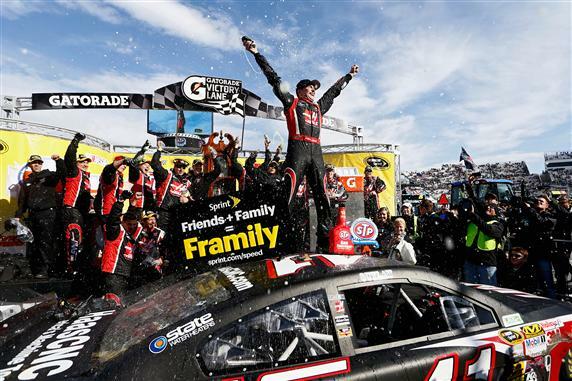 41 Stewart-Haas Racing Chevrolet and the first victory as a Sprint Cup crew chief for Daniel Knost. Dale Earnhardt Jr. finished third in a race that produce a record 33 lead changes and a sixth consecutive different winner to open the 2014 season. Joey Logano ran fourth, followed by Marcos Ambrose and Matt Kenseth. Kevin Harvick, Aric Almirola, Clint Bowyer and Paul Menard completed the top 10. Busch stole the victory from Johnson, despite an earlier collision with Brad Keselowski’s Ford that cost Keselowski 31 laps. “We’re done,” Busch said tersely after running into the back of the No. 2 Team Penske Ford, a car Busch drove for much of his career, to date. That was far from the truth. Busch worked his way back into contention and restarted third on Lap 466 after caution for Carl Edwards spin in Turn 2. On Lap 473, he got the nose of his car under Johnson’s No. 48 Chevy and grabbed the lead. Ten laps later, Johnson — who led 296 of the 500 laps — regained the top spot with a slight nudge to Busch’s bumper, but Johnson fought a loose handling condition the rest of the way and couldn’t keep the Stewart-Haas Chevy behind him. Busch, like Johnson, was driving a Hendrick Motorsports chassis powered by a Hendrick engine. “I didn’t know if we’d be able to do it,” Busch said. “The 48 car is king here, him and the 24 (Jeff Gordon, who also has eight Martinsville wins). This is the old theory ‘If you can’t beat ‘em, join ‘em.’ I had a Hendrick chassis prepared by Stewart-Haas Racing, a Hendrick motor. So thanks to those guys and Chevrolet. Johnson, who has been having uncharacteristic difficulty closing out races of late, did everything possible to keep Busch at bay.